Westlawn Institute of Marine Technology | Who Studies At Westlawn? Among the more than 500 students currently enrolled at the Westlawn School of Yacht Design, few would match a description that might be called typical. They hail from 59 countries worldwide, although the majority live in the United States. While most students maintain full-time employment during the time they complete coursework, they represent a variety of professions both within and outside the marine industry. What remains common to all Westlawn students, according to school director Dave Gerr, is a keen interest in boats and the sea, and a desire to channel that interest into practical design skills. "We don't even require that our students come to us as accomplished artists," Gerr said. "While the ability to draw is always a plus, we concentrate our learning in the direction of developing design concepts, both in improving existing products and in shaping new, innovative boats that meet the evolving needs of the market." Recognizing the reality of its students' employment commitments-the majority also have families-the Westlawn School has structured its Yacht Design Course to accommodate both full-time and part-time study. This flexibility allows students, working at home, to complete the course within a two- to four-year period. 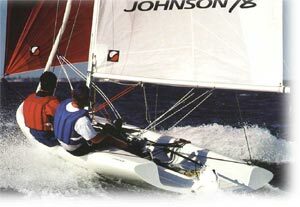 Located in Mystic Seaport, Mystic, Connecticut, the Westlawn School of Yacht Design offers specialized education to students throughout North America and worldwide. The school, an affiliate of the American Boat & Yacht Council, is approved by the Connecticut Department of Higher Education, and accredited by the Distance Education and Training Council.